Stop using methods and strategies that weren’t designed for your business and instead develop a custom blogging plan. Generating blog traffic can be challenging. One surefire way to make it even more challenging is to not be strategic about it. You’ve probably read a half dozen blog posts on promoting your blog content, but have you ever considered that generating traffic starts well before the promotion phase? Today we’re exploring the structure of your blog as a whole, and how that structure relates to the strategies you should be using to generate traffic. Our hope is that by the end of reading this post, you will be able to identify which method you are currently using in your business and assess whether or not that is the right method. If not, you’ll be able to choose the method that will produce greater ROI. Let’s dive straight into the three different methods! You’ll see that once you nail the structure, you can rely on the right promotion tactics and generate more quality traffic. A company creates a digital publication full of high-interest, shareable content. Think of your favourite digital publications. Maybe you regularly read Thrive Global or Into the Gloss or Techcrunch? The publisher method is essentially the same thing. You’re curating content around a certain theme or subject, typically quite broad (wellness, beauty, technology), and you feature tons of different pieces within that theme. A company using this method typically is able to produce a lot of pieces of content, perhaps five or more per week. But more rarely, they might be taking more of a “magazine” style approach to their publication, and release batches of high-quality content monthly or quarterly. Let’s take a look at some example websites that are run like digital publications to help you understand this style. What better example of a publication than a publication? 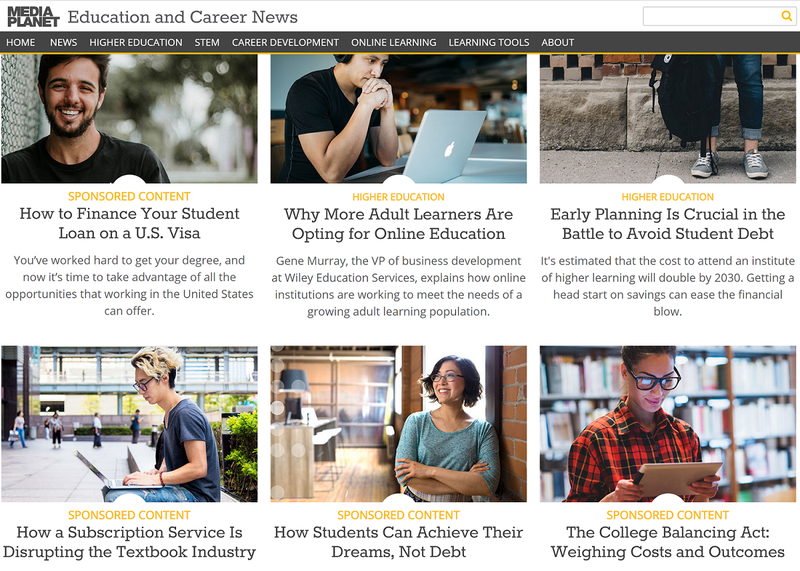 Educationandcareernews.com produces a ton of content on college education and entering the workforce. Make no mistake: a publication is still a business. They have a lot of sponsored content to keep revenue coming in, and of course, they also have ads. Next, we’ll see examples from businesses that are selling something other than ad space on their site. Shutterfly — every mum’s favourite site for printing photo books, homemade calendars and personalised gifts—has their company blog organized like a publication, which they call Ideas. Keep in mind that having a publication style does not mean that the content is not organized or categorized in a meaningful way. After their seemingly random recent posts section, they do categorize by topic, such as Photography or Parties. However (as in contrast to The Librarian style, which we will discuss shortly), these categories are not highly niched, nor are they organized logically. 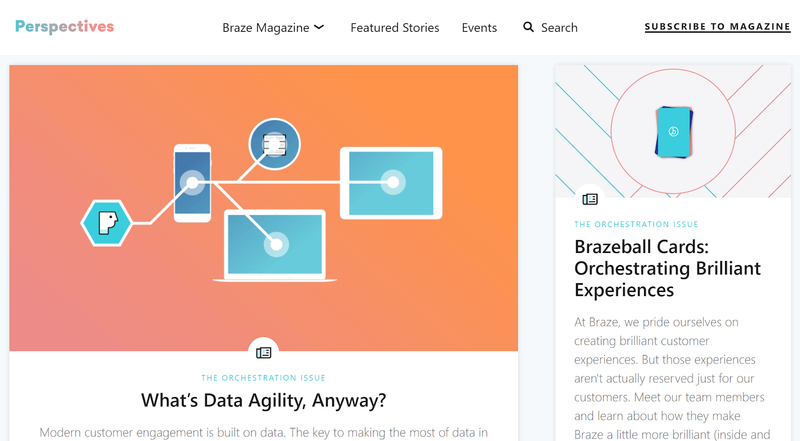 Approximately every other month, Braze, a platform for cross-channel personalization, publishes content around a certain theme. These content pieces aren’t targeting SEO terms, and are rather focused on building out the company’s thought leadership. Unfortunately, many companies choose this method even though it’s a terrible waste of money for them. Market leaders in any industry: You’ll need a big marketing budget to pull this off, and if you’re already way ahead of the pack, this method can help you create future success by turning your blog into a product of its own. Sites that feature advertisements: An obvious recommendation, sure, but if you’re generating revenue with ads, then treating your blog like a digital publication is usually the best way to get more impressions, which lead to more clicks. With The Publisher, you’ll need to rely on more costly promotion methods. It will be critical to build up a large following on the social media platforms used by your target audience. That way, every time you push a new piece, you have an audience waiting and ready to consume it. Partnerships with influencers and press contacts will be important as well. Of course, you can generate search traffic by targeting some SEO terms, but most companies who use this method rely on their audience and social sharing for traffic. Feeling like this method isn’t the right fit for you? Not to worry! We’ve got two more on deck. A company creates a comprehensive library to educate you thoroughly on one topic. In stark contrast to The Publisher, The Librarian is much more frugal. With this method, you pick a content vertical (something highly specific and actionable) and help your readers become an expert in that area. You don’t focus on building an audience. You build a library catalogue within a certain niche that is easy for site visitors to navigate through, whether they return or not. If your product or service stretches across a couple of different areas, then you can create multiple content verticals and fill them chronologically, writing more advanced pieces as you progress deeper into each topic. 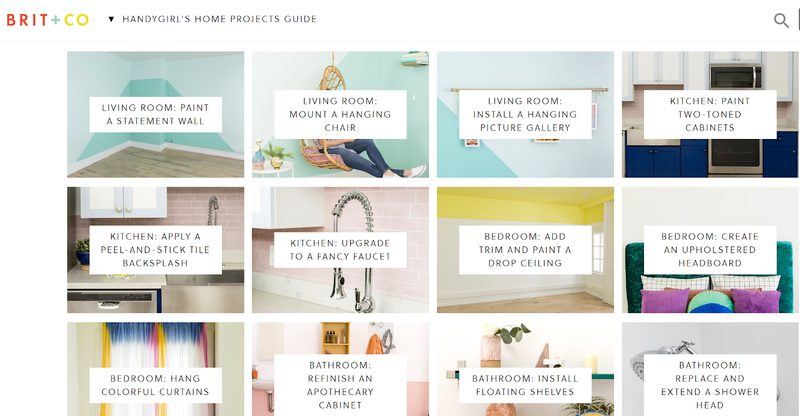 Sherwin-Williams partnered with Brit + Co to produce 12 pieces of content in a Handy Girl’s Guide meant to teach readers how to make stylish home improvements all on their own. This guide, which is an evergreen campaign, is very different from Brit + Co’s usual content style, which is definitely more of a publication. 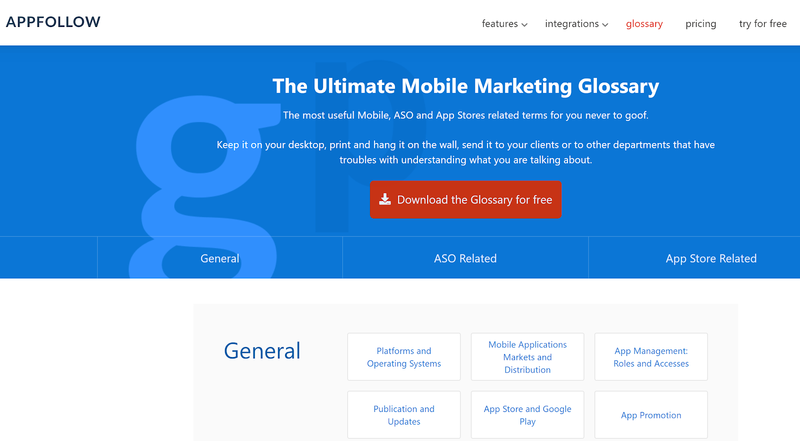 Appfollow, a platform for managing reviews and rankings of mobile apps, has a glossary with every mobile marketing term imaginable. While Buffer’s social media marketing blog has been produced and organized more like a publication, they were smart to later create a Social Media Marketing Library so that site visitors can gain mastery in a certain topic. If you’ve already created a lot of content, then you can absolutely retrofit this style to fit your existing content, and then go forward more strategically. Startups in any industry: When you’re on a tight budget, you’ll likely get better results when you go deep, not wide. Companies that serve a topic of interest or hobby: Even outside of B2B, this concept works great. Imagine how much easier it would be to learn to sew if you found a blog that was organized by lesson type, rather than showed a bunch of random tips interspersed with patterns. When creating a library, you will prioritize content creation logically based on what your site visitors need to learn next on their path to mastery. This means that SEO keyphrases will not trump the logical organization of your library. However, SEO can still have a big impact. After you’ve determined the topics that need to be covered in your library, you should then see whether any of them have a relevant keyphrase that you can include in the headline, URL and first paragraph of your blog posts. Use a free tool like Keywords Everywhere, or a paid on like SEMRush. Outreach can also work really well when using this method. After you’ve created a good chunk of the library, send a personalized email to several hundred people who would get a ton of value out of reading it. You can rely on SEO, outreach, and eventually maybe word-of-mouth as your library grows in value and reputation. You can also layer social media promotion on top, but use SEO and outreach as your foundations. A company goes after any SEO keyphrase that is of value to the business, in no particular order. When you’re able to get search traffic, you don’t even really need an audience. What if building an audience is a waste of your time? 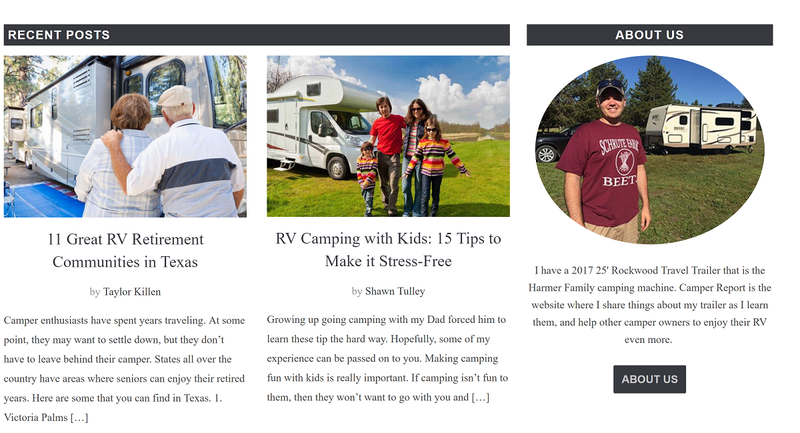 Camper Report is a review site for RV’s. The site’s revenue model is affiliate marketing based on RV and gear sales. The site’s owner (who teaches his SEO-focused method over at IncomeSchool) used no social media methods to build traffic initially and is only recently starting to use YouTube. 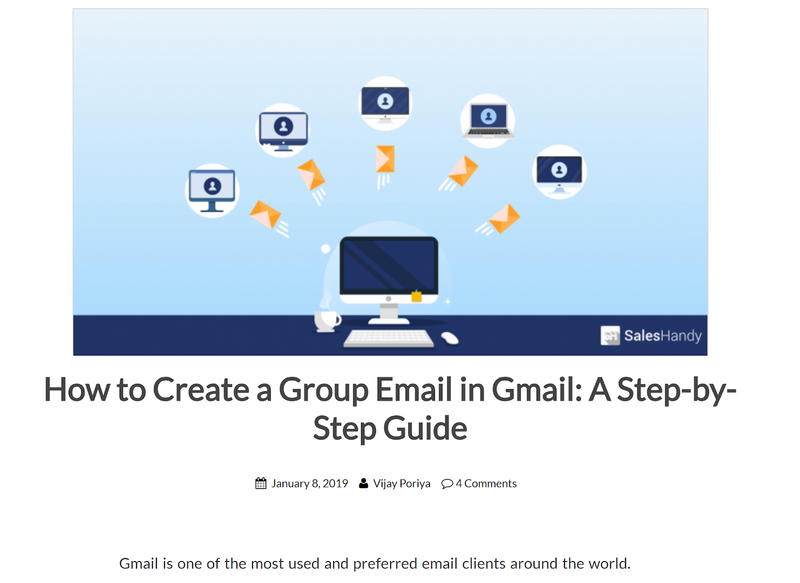 Here’s another example of a blog using mainly SEO to drive traffic, this time the example is from a sales email tool. How to follow suit? Find a keyphrase worth targeting, and get writing. Check out this ecommerce site’s recent posts and you’ll see that they’re riding the Search Tycoon train. Too corny? Sorry. But seriously, check out these titles. “Festival Lookbook 2019.” “Fanny Pack Trend 2019.” You get the point. If you’ve got an ecommerce, get like these guys and start writing blogs that promote your products. Startups in any industry: You can invest in content and let SEO do the heavy lifting, without having to invest in social media as well. Companies with no social media team or budget: No social media employee? No problem. Affiliate marketing sites: If you’re making money from affiliate income from sales after people read your reviews, you’ve got tight profit margins. You’ll want as much free SEO traffic as you can get. Ecommerce websites: When people are shopping, they are searching! In some industries, people aren’t actively searching for what you sell. In ecommerce, customers are definitely searching, so you better make it easy for your company to get found. B2B companies that don’t want to “build an audience”: For many B2B companies, it’s hard to look like a rockstar on social media, and PPC costs are astronomical, so organic traffic is a huge win. If you’re in an uncrowded industry (in terms of search rankings), you can create 1000+ word pieces of blog content going after every high-value keyphrase you find inside of your favourite SEO research tool. If your industry is crowded, however (hello, nearly every facet of marketing), then you’ll need to produce longer pieces of content to have a chance of positioning, while also building backlinks with content partnerships and outreach. When you have the right method for your blog, it becomes much easier to generate high-quality traffic. Think of these three methods as the foundation of your blog. Then you can layer other strategies on top to drive new traffic to your blog as a whole, or to individual pieces. Expert round-ups: Interview pros in your field and quote them in your blog posts, then ask them to share it once it’s live. The more pros you quote, the more traction! Automate your Pinterest: When it comes to blog traffic, don’t underestimate Pinterest. The Tailwind app can be life-changing for bringing new traffic to evergreen posts. It will repin your pins, and then delete the duplicate that was repinned the least. Recycle your social posts: MeetEdgar and MavSocial are both great options for repeating your social media posts outside of Pinterest. When done right (not overdone), the chances of the same person seeing repeat posts or tweets is highly unlikely. Do outreach to build up backlinks: Outreach can still work very well, but you’ll have better success building up mutual relationships with other bloggers or content managers, as opposed to spamming a big list of folks. Swap backlinks or guest post content. Or agree to regularly share each other’s content. Of course, build relationships with companies who are non-competitors in the same industry or niche. Master your newsletter: Your weekly email marketing newsletter can and should be a driver of traffic and new business. Driving traffic to your blog from your newsletter can help nurture prospects in the case of long sales cycles, encourage repeat purchases from existing customers, and deepen your relationship to your customers, if you have a SaaS or other subscription-based business. Did learning about these 3 foundational methods open your eyes? Are you combining methods strategically at your company, or accidentally? Let us know any ahas or takeaways over on twitter!